If you are lucky enough to be in Southcentral Alaska this weekend, you know how beautiful the weather is. Spring is definitely here! I left the Juneau circus for the weekend to cover the Alyeska Slush Cup. If you didn’t see our article, check it out here. Paxson Woelber got some great pics and Scott Jensen made an awesome video. I head back to Juneau tomorrow for what is sure to be an exciting week in Alaska politics. Governor Michael J. Dunleavy has had yet another weird week. He made this Twitter post on Thursday about all the Alaskans that have been sending him red pens. There is just one problem. The letters are form letters from from Mike Porcaro with Porcaro Communications. His firm got big money for ad placement for the Dunleavy IE during the campaign. This is what one would call a social media fail. Governor Dunleavy has also chosen some odd battles to get in with the Legislature. The first one is over the forward funding of education. Last year the Legislature passed a bill to partially forward fund education. Dunleavy thinks that is money he can veto. The Attorney General, Kevin Clarkson, agrees. Legislative Legal and Legislative Finance disagree. This Landmine article explains it all and includes pertinent memos and legal opinions. The weird thing is that even if he were to challenge and win in court, all he would be winning is the ability to veto education funding. That won’t go over well with the public. “The House Majority needs to be honest with regard to the actions they took last year. They are fully aware that they chose to underfund Senior Benefits in their own budget last year under the previous Administration,” added Governor Dunleavy. There is just one problem with that. The bill in question from last year passed 59-1. you can guess who voted against it. And it did not require HSS to cut off payments. Check out this letter to Commissioner Crum from Senate President Cathy Giessel (R – Anchorage) and Senator Tom Begich (D – Anchorage) in response to the claims made by Dunleavy. It is also signed by Senators John Coghill (R – North Pole), Scott Kawasaki (D – Fairbanks), and Senator Donny Olson (D – Golovin). When Giessel and Begich are in full agreement on an issue, you know it’s legit. And then there is the drama surrounding the Amanda Price confirmation process. Price is Dunleavy’s pick for the Commissioner of the Department of Public Safety. Her confirmation process has been, well, interesting to say that least. On Thursday in a House State Affairs Committee hearing, public testimony got real loose. Former Walker staff called in and gave conflicting testimony about their time working with Price. It was quite the hearing. This Landmine article explains what happened and the issues surrounding Price’s confirmation. The House passed an operating budget on Friday with $200 million in cuts, far less than what Dunleavy proposed. It now heads over to the Senate. It will be interesting to see what their number is for cuts, and what will happen in the conference committee. Dunleavy has made it clear he is willing to pull out his red pen. The other issue will be the dividend. He can veto but he can’t add money. The likely outcome will be a dividend lower than the $3,000 he proposed. And forget about his dividend repayment plan. He will probably veto things to punish certain legislators who do not support a full dividend. Then the question is does the Legislature have the 45 votes to override his vetoes? It could get very loose. 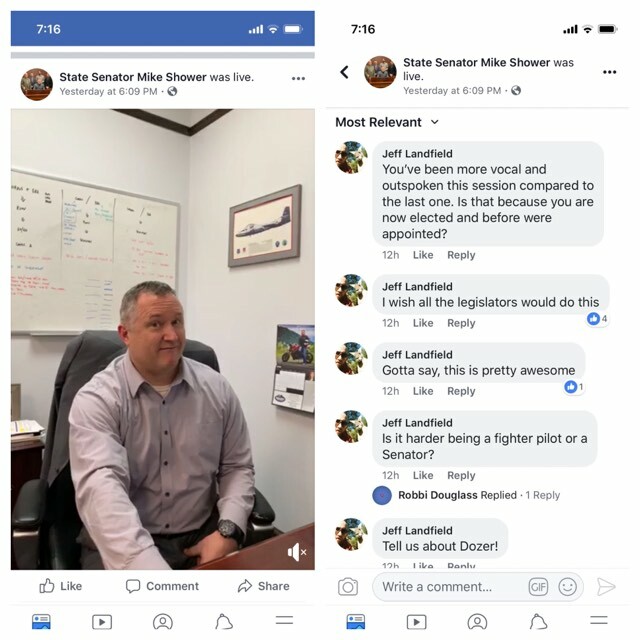 Senator Mike Shower (R – Wasilla) did a one hour Facebook Live AMA on Thursday. It was very informative and very entertaining. Shower is not afraid to say exactly what he thinks and he did a great job at ignoring some of the more loony questions. One of the best parts is when he said, “Anchorage has swung hard left. And you could almost take the Anchorage Assembly and plot it right down in Berkeley, California and it would be just fine!” Legend status. He even answered some of my questions! You can watch the whole thing here. There has been a lot of talk lately about the billion dollar sale of Anchorage Municipal Light & Power to Chugach Electric. It was approved by the Anchorage Assembly and Anchorage voters last year. Now it’s up to the Regulatory Commission of Alaska for final approval. Chugach Electric filed an Asset Purchase and Sale Agreement with the RCA earlier this month. One interesting thing is former Anchorage Mayor Dan Sullivan, who was recently appointed to the RCA by Governor Dunleavy, was publicly opposed to the sale last year. The RCA is made up of five commissioners. The sale will likely be approved by the Commission. The decision is estimated to take six months. 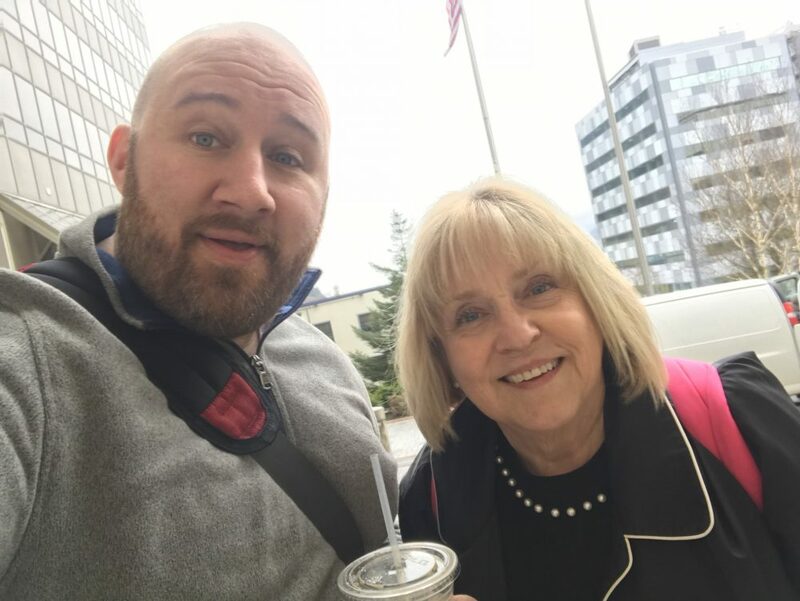 Things got real loose at the Alaska State Commission for Human Rights this week. In response to the whole “Black Rifles Matter” bumper sticker disaster, Executive Director Marti Buscaglia resigned this week after being suspended for 15 days by the Commission. Then the chairman and vice-chairman of the Commission resigned. Brandon Nakasato, the chair, cited the need for new leadership after the bumper sticker controversy. Freddie Olin IV, the vice-chair, said that his fiance accepted a job on the east coast and that it was not due to the controversy. Dunleavy appointed Cynthia Erickson and Debbie Fullenwider to fill their seats. The House and Senate held their annual softball game this weekend in Juneau. The House was leading but the Senate tied it up at the bottom of the 7th inning. They ended up losing to the House 14-11 in the eighth inning. But the best part was a special appearance from Representative Laddie Shaw (R – Anchorage). Dude literally came in hot in his paraglider and landed on the field! There are legends. And then there is Laddie Shaw. 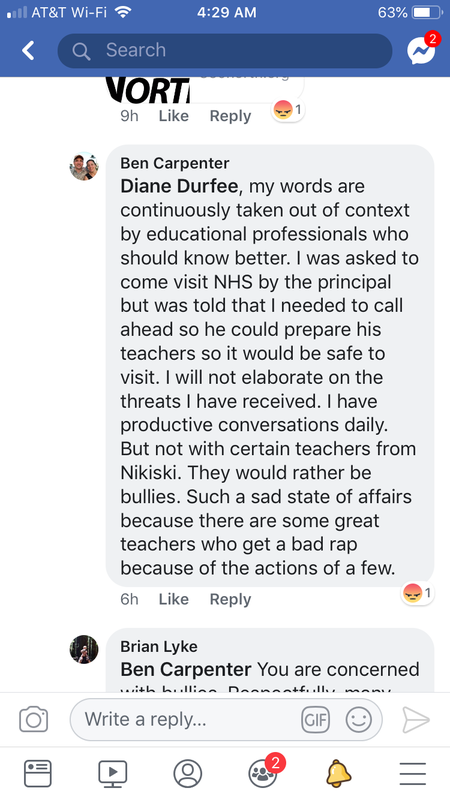 Check out this Facebook comment from Representative Ben Carpenter (R – Nikiski). Sounds like he needs a safe space. Bizarre. My good buddy and prolific Facebook commenter was recently spotted in Juneau. 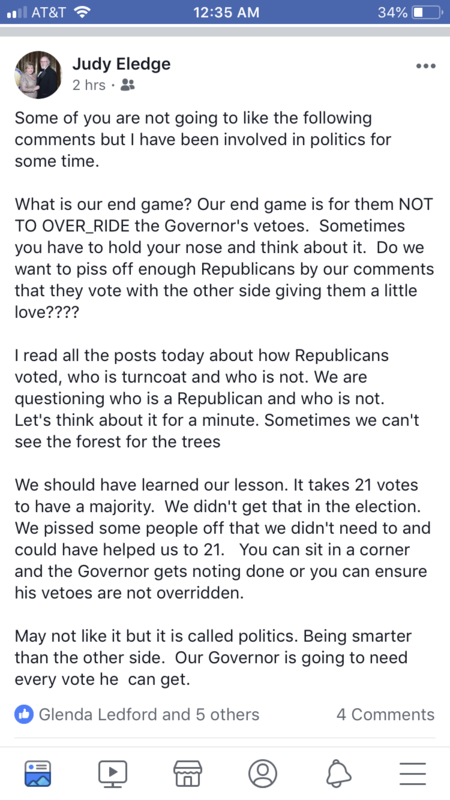 It looks like Judy Eledge is starting to figure out that the Republican strategy of going after other Republicans may not be the best idea. Proud of you, Judy! There were many Loose Units this week. But one definitely stood out. He may not be a well known name to younger folks, but Alaskans who have been around for a while definitely know this guy. This week’s Loose Unit is former Alaska Senator Mike Gravel. Gravel recently announced his campaign for president – at 88 years old! But he is not actually planning on winning. He just wants to get enough donors so he can be in the debates. He has been encouraging people to donate just $1. Very loose. This Mashable article (I’ve never heard of that before I found this article) provides a very entertaining summary of Gravel’s bizarre campaign. Gravel served as one of Alaska’s senators from 1969-1981. Prior to that he served in the Alaska House from 1963-1967, serving one term as Speaker of the House. Gravel also ran for president in 2008. While his campaign is very loose, it is also very entertaining. Mike, if you are reading this, I would love to do a podcast with you! Let me know. C’mon, you can’t talk about Mike Gravel and not mention the Pentagon Papers. American Hero. The US would do well to let more than GOP v Democrats into the debates. This whole 2 party system thing isn’t really working out for us. Shut up, Judy. You have killed so many Republicans with hate. Walking deathhag.